I am so not the fancy blogger with giveaway savvy. I'm more about words and stories and less about gadgets and gizmoes and html. So sometimes it takes me a while to finalize my giveaways. But I always do! Thanks for your patience. Now if I'd just hear back from BlogHer about who is in the final drawing for the cruise! Wieners, please email me so I can get these fabulous items to you! Now that we're done with the wiener talk, let's move onto RUMP! You guys...this is a really great book. An acquaintance of mine from college wrote this and it's fantastic! I was so surprised when I found out that cute little Liesl from my MDT days was a published author. Like, for real real! She sent me a copy of her book and Vic and I read it together. It was absolutely delightful. I'll be honest, I've always thought the story of Rumpelstiltskin was a bit odd. But this book puts it all into perfect magical perspective. It's great that it is a book written for elementary/jr. high aged kids. That is an age that doesn't get as much attention in the great books department. Young Adult, yes. But school-age children haven't seen anything this great since Junie B. Jones. I can totally see this being made into a feature film (cartoon) someday. We loved it. The gnomes were our favorite characters. Please read it to/with your kids or students. Teenagers would love it as well. "Rump's mother died the day he was born. More importantly, Rump's mother died before she told him his full name. So now Rump has to live with a half-name that sounds like a cow's behind. In a land where names help determine one's destiny, this is less than desirable. Life goes from bad to worse when Rump discovers he can spin straw into gold. Thanks to a curse and to a miller's greediness, suddenly Rump is thrown into an adventure where every time he tries to help, he fails. Finally, Rump runs away from it all. Will he ever find his true name? Can he find a way to keep the gold from controlling him? 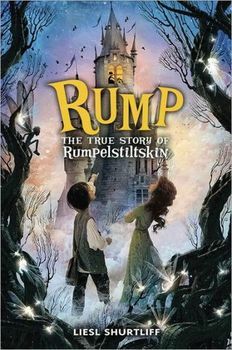 If you think you know the story of Rumpelstiltskin, this book will definitely surprise you!" Liesl has been doing a nation-wide book tour and her book, RUMP, can be purchased on Amazon, at Barnes and Noble, and most bookstores. I'm so proud of her (and jealous!) for her fine work. She's a mother to 3 children and does homeschooling while living in Chicago. I always thought she was a doll back in our dancing days, but now she is turning into one of my heroes. I hope you enjoy the book as much as we did! I love a good book to ready with Ruby, thanks!